영국 남자 조쉬가 한국에 빠진 이유는?! + 인생 목살 먹방!? 오늘 보니까 졸리 채널에 구독자수 80만명 넘게 되었답니다. 큰 축하 드립니다 브로들! 오늘도 재밌게 보시고요! 다음 주 화요일에 봬요! 사랑해요! Hi!!! Welcome to Dan and Joel! Hope anyone and everyone in Korea has had an amazing Chuseok, and is still enjoying some time-off! Today is the second episode of our Dinner Talks series, after an amazing conversation - and salad! - with Gabie last week! Like last week, today's guest needs no introduction, and it was such  a pleasure to invite Josh for some amazing Korean bbq and hear about his story! We've been really inspired and helped by Josh and Ollie, and we're so excited to keep supporting them on their amazing journey! We've also just noticed that their Jolly channel has just achieved 800k subscribers! Huge congratulations! 한국을 사랑하는 두 젊은 브리티쉬 남자. 조쉬 올리와 영국남자와 졸리 채널에 몇번 출연 했어요. 한국 문화도 좋아하고 한국 음식도 너무 좋아해서 우리의 채널을 통해 우리의 한국 탐험 보여 주고 싶어요. 또는 한국 사람들과 어울리는 것도 좋아하니까 여러분들하고 친구 하고 싶어요!!! Who are Dan and Joel? 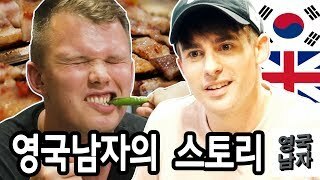 Two British guys who love Korea, and have featured on Korean Englishman and Jolly with Josh and Ollie many times. We love Korean culture, and are crazy about Korean food, and we want to show our own experience and adventure of Korea through our channel. We also love Korean people, and are excited about spending time with you all! 정이 넘치는 시장 탐험 (+ 아름다우신 할머님들)! 국가비님과 영국 크리스마스 와인 찌개 요리 먹방!? 단앤조엘이 길거리에서 직접 만든 '영국' 김치찌개 잡수신 한국 할머니들의 반응!? 한국 사랑하는 외국 남자들이 영국에서 김장 했다고요!? 한국 사랑하는 외국 남자 단 앤 조엘이 유튜브 시작했습니다! 안녕하세요! 국가비씨와 옥상 초리조 샐러드 먹방 이야기! ?